David Harris Executive Director of the American Jewish Committee honors French President Nicolas Sarkozy with Light Unto The Nations Award. France's new President: Good for the Jews? This article is an edited transcription of attorney Isabelle Tahar Miller's talk at the 2007 Temple Beth Hillel-Beth El Torahthon. Recently elected French President Nicolas Sarkozy indeed fascinates or irritates more than any other French President has before. He certainly does not leave anyone indifferent. I would like first to introduce myself briefly: I was born in Paris to a traditional Sephardic-Tunisian Jewish family. Tunisia was a French protectorate and my family arrived in the mid-fifties in Paris after Tunisia became independent. I was educated in French public schools and graduated from the Sorbonne law school. I have also lived in Israel for four years where I took the Bar. I speak Hebrew fluently. I have been married for nine years to an American lawyer and we have three young children. My passion is politics — writing, defending Israel against media bias, and giving lectures. The statements made here are purely personal and are a compilation of news observation and fact analysis over the past two years. Video of Nicolas Sarkozy's remarks to the American Jewish Committee. A few years ago, back when anti-Semitism was rampant in France, I had given a lecture to the American Jewish Committee about the difficulty of being Jewish in my home country. But, I wondered, was it still true in 2008? When in France last summer, I had observed that there had been a change, a positive change for Jews. While young Muslims seem to be more discreet and less visible, Jews on the contrary were again able to openly wear a kippah, more kosher places were opening, fewer police forces were visible around synagogues, and the statistics of aliyah from France, numbers issued by the Jewish Agency, suggested a rapid decline in the months following Sarkozy’s election. Whether a miracle or illusion, I was puzzled and asked myself: How did he do it in such a short amount of time after years of deep concern? Explaining the source of this notable improvement became my focus, and the topic popped up in my mind naturally: I would talk about Sarkozy, Israel and the Jews. The warm bond between the Jewish community and the newly elected president was too refreshing and exceptional after decades of pro-Arab policy, not to be mentioned. But my personal experience as a kid growing up in France has taught me too often to keep my head on my shoulders and to moderately trust the French. Wasn’t my grandfather Meir, of blessed memory, always saying in his Judeo-Arabic dialect, meha bunesh — "they don’t like us""? When Sarkozy became president in May 2007 at age 52, he waved goodbye to the old political order and started his own. Andrée Mallah, mother of French President Nicolas Sarkozy, and daughter of Benico Mallah. Nicolas Sarkozy, also called "Sarko" by both his supporters and opponents, was born in 1955 in Paris. 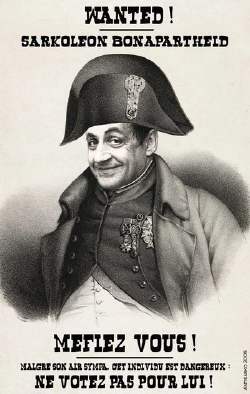 He is the son of Paul Sarkozy, a Hungarian immigrant whose family belonged to the lower nobility of Hungary, and a French mother, Andrée Mallah, the daughter of Greek-Jewish doctor, Aaron Mallah, a wealthy urologist with a well-established reputation in the mainly bourgeois 17th arrondissement of Paris. Aaron Mallah was born in 1890 in the Sephardic Jewish community of Salonika (Thessaloniki) part of the Ottoman Empire. In 1904, Aaron Mallah left Salonika for France with his mother. He became a doctor and served in the French Army during World War I. Mallah met Adèle Bouvier (1891–1956) a recent war widow born in a bourgeoise family of Lyon, whom he married in 1917. 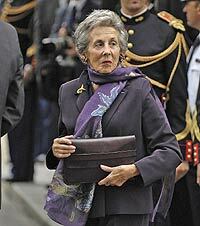 Adèle Bouvier, Nicolas Sarkozy's grandmother, was a Catholic. Mallah, for whom religion had reportedly never been a central issue, converted to Catholicism upon marrying Adèle, following her parents' request, and he changed his name to Benedict. Although Benedict Mallah converted to Catholicism, he and his family nonetheless had to flee Paris and take refuge in a small farm in Corrèze during World War II to avoid being arrested and delivered to the Germans. During the Holocaust, many of the Mallahs who stayed in Salonika or moved to France were deported to concentration camps. In total, 57 family members were murdered by the Nazis. After being married, Paul Sarkozy and Andrée Mallah, Nicolas’s parents, settled in the 17th arrondissement in Paris and had three sons: Guillaume, born in 1951, an entrepreneur in the textile industry, Nicolas, born in 1955, and François, born in 1957, an MBA graduate and manager of a healthcare consultancy company in New York. In 1959, Paul Sarkozy left his wife and 3 children. That event will mark for ever Nicolas’s life. During Sarkozy's childhood, his father refused to give any financial support, so the family lived in a small mansion owned by Sarkozy's grandfather, Benedict Mallah. According to Sarkozy, his faithfully Gaullist Jewish grandfather was more of an influence than his own father, whom he rarely saw. Sarkozy was however raised in the Catholic faith of his household but the Jewish soul of his grandfather enlightened him throughout his childhood. Sarkozy has said that having been abandoned by his father shaped much of who he is today. As a young boy and teenager, he felt inferior and insecure by his physical stature of 5 feet 5 inches tall, and is said to have developed a considerable amount of resentment against his absent father: "What made me who I am now is the sum of all the humiliations suffered during childhood," he was to say later. Sarkozy was enrolled in a private Catholic school. After his baccalaureate, he attended law school at the University of Nanterre, the starting place for the May '68 student movement. Sarkozy soon joined the right-wing union of the university where he was very active. He then passed the Bar and became a lawyer. Unlike most of the French ruling class, Sarkozy did not go to the École Nationale d'Administration, the National French Administration School. From that perspective, Sarkozy is not the typical French politician. Sarkozy's father had told him that having a name like Sarkozy was a handicap in France and he would never make it. Determined to prove his father wrong, Sarkozy went into politics. His political career took off at the age of 22, when he became a city council representative in Neuilly-sur-Seine, a wealthy and exclusive western suburb of Paris. In 1983, he became the Mayor of Neuilly a city he administered until 2002. During that time, he regularly attended the city Hanukkah candle lighting celebration organized by the Chabad movement. Videos of his presence are viewable under the website youtube.com. And obviously Sarkozy seems comfortable with our fellow Jews. He became a national figure in 1993, when he walked into a city public nursery where a suicide bomber was holding children hostage. He talked the man into releasing them, one at a time, and carried some of the kids out himself. This heroic act served to establish Sarkozy's reputation for courage and risk-taking. As mayor of Neuilly, Sarkozy met his second wife, Cécilia Ciganer-Albeniz, when he officiated at her wedding to famous TV host Jacques Martin. Cécilia was the great-granddaughter of the Jewish composer Isaac Albéniz on her mother's side and the daughter of André Ciganer (neé Aron Chouganov) a Russian émigré believed to be of Jewish and Italian origin. Sarkozy married her in 1996 and the two divorced in October 2007. During the 11 years of their marriage, Cécilia became his most important supporter and adviser. She acted for years as his chief aide and had an office next to his. It is remarkable that Sarkozy chose to honor, in his swearing in ceremony, the music and talent of Cécilia’s great grandfather. The inauguration was a dazzling beginning and it was a premiere for a Jewish composer to be honored on such an important day. Throughout most of his career, Sarkozy had been seen as a protégé of Jacques Chirac. However, in 1995 he spurned Chirac and backed his rival Edouard Balladur for President of France. It is widely believed that ever since 1995, Chirac has considered Sarkozy's siding with Balladur as treason, and the two men despised each other. Chirac still won the election and Sarkozy lost his position as Minister of Budget. He found himself outside the circles of power. In 2002, however, after his re-election as President, Chirac chose to appoint Sarkozy as Minister of Interior. Sarkozy gradually became known for his strong stance on law and order issues. It's interesting, that as the son of a foreigner, Sarkozy carried out a tough law-and-order campaign against delinquent immigrants. He welcomed legal immigration, though, and pushed through measures to curb illegal immigration including deportations. He increased efforts to assimilate immigrants already in the country as well as to integrate more skilled migrants into French society. "I passionately love the country I was born in," he said. "I don't accept people living in France without respecting and loving France. I don't accept people moving to France without bothering to speak and write French. . . . If you live in France, then you respect the values and laws of the Republic," he has said. Sarkozy advocated amending the 1905 law on the separation of church and state, mostly in order to be able to finance mosques and other Muslim institutions with public funds so that they would be less reliant on money coming from Arab countries and specifically the Persian Gulf. This call for state help to build mosques became controversial even within his own political group. With 11 million Muslims on its soil, France is facing increasing radical Islamic proselytism. Sarkozy was one of the few political figures to stand up and confront the radical Arab-Muslim community when they pushed to impose their values against those of the laïcité (separation between religion and state) of the Republic. The debate over the scarf and whether Muslims girls could wear them in public schools became fiery. Sarkozy sought to ease the tense relationships between the French population and the Muslim community. Unlike the Jewish community, organized in the form of a central Consistoire/Beth Din by Napoleon, the French Muslim community has had a lack of structure, with no one group that could legitimately deal with the French government on their behalf. Sarkozy felt that the founding of such an organization would be desirable. He supported the foundation in May 2003 of the non-profit Conseil Français du Culte Musulman ("French Council of the Muslim Faith"), an organization meant to be representative of French Muslims. Towards the end of his first term as Minister of Interior, Sarkozy was, according to polls conducted at the beginning of 2004, the most popular and unpopular politician in France. In October 2005, violent riots broke out in Paris suburbs. He was the top cop in charge of the police force during the three weeks of violent rioting in immigrant neighborhoods all around the country. It was the worst unrest France had seen in decades. The northern suburbs of Paris, an old-communist area called the red belt, is now largely inhabited by Arab and Black Muslim minorities, immigrants of North and Sub-continental Africa. Those suburbs commonly designated as "Les Territoires Perdus de la République — the Lost Territories of the Republic — are lawless zones where petty criminality and gang operations happen daily. Police sources indicate that huge weapon arsenals have accumulated there following the Serbian-Kosovo conflict, purchased by gangs using money from drug dealing. Police are unwelcome in these areas and are afraid of retaliation if they try to enforce the law. After days of unrest and thousands of cars burnt down and stores destroyed, Nicolas Sarkozy went on a visit to a suburb under fire. Answering to a resident who addressed him with a "Quand nous débarrassez-vous de cette racaille?" ("When will you rid us of this scum? "), Sarkozy vowed to clean the area out "with a Kärcher," — a Kärcher being a well-known brand of pressure-cleaning equipment. An anti-Sarkozy "Wanted" poster casting Sarkozy as "Sarkoleon Bonapartheid" saying "Be careful. Despite his nice looks, this is a dangerous individual. Do not vote for him!" His reference to the youth of the housing projects as voyous (thugs) and racaille (scum) turned Sarkozy into the "bête noire" of the Left wing and of minorities. Anti-Sarko movements and websites (such as toutsaufsarko, featuring a countdown calendar for his presidency) have flourished on the Net. Loved by some for his tough discourse and hated by others who consider him the enemy of equality, France was cut in two. It then became clear that Sarkozy would go on to seek the presidency in 2007. His controversial vow to get rid of the "scum" certainly launched his campaign for President and helped him politically. He got comfortably elected on May 6th with 53% of the votes against his rival, Segolene Royal, a socialist. The turmoil predicted by the left wing following his election did not happen. The suburbs remained calm despite few isolated incidents. Why Does Sarkozy Appeal to the Jews? It is true that the election of Sarkozy has brought tremendous hope for the Jewish community in France and outside of France, but also for an Israel used to decades of pro-Arab policy. As most American Jews are traditionally voters of the Democrats, French Jews were commonly steady voters of the Parti Socialiste (Socialist Party). Long-time rejection of right-wing ideas by Jews are probably rooted in the aftermath of the Dreyfus Affair which shook France in the early 1900. At the time, conservative party ideas transpired from those of the extreme right. The Jewish vote in France gradually inclined toward the right, when in the midst of the second intifada in 2002, left-wing parties started to embrace anti-Zionist rhetoric. As Simone Veil, a respected member of the prestigious Conseil Constitutionnel (Constitutional Supreme Court) declared to a French magazine, anti-Semitism was changing face. It was coming from the left. Relayed by media pictures and reports of Israeli tanks in the West Bank, the hate for Israel quickly degenerated into attacks against Jews. Arab students supported by left-wing movements used universities as local platforms to fight Israeli policy and attack Zionism. In this international context and fueled by violent sermons given by their religious leaders, young Muslims have come to believe that Palestine is their country and terrorism is a courageous way to fight the occupation. Two main events prompted an increase of violent anti-Jewish and anti-Israel acts: the death of Mohamed Al Dura, the young Palestinian boy, presented on national TV as a deliberate killing by Israeli soldiers and recently recognized by a French court as a montage created by France's TV Journalist Charles Enderlin; and the massacre of Jenin in April 2002 that was also later proved to be a manipulating lie on the part of the Palestinians. There was not one day without insults, physical threats, provocations, heinous graffiti, physical violence against Jews, vandalism, Molotov cocktails thrown against synagogues, desecration of Jewish tombs, open boycotts in supermarkets of Israeli products, and on and on. The climax was the tragic murder of Ilan Halimi, a young Parisian Jew kidnapped, tortured, and killed by a violent gang. Life became hellish for French Jews, who started immigrating to Israel in numbers. At the time, while the political response from Chirac’s government was slow to come, Nicolas Sarkozy showed himself to be a very reactive Minister of Interior. He was one of the few politicians standing up confronting the Arab-Black Muslim community suspected of encouraging aggressions. In favor of a zero-tolerance policy for anti-Semitic and racist crimes, he met with the presidents of Jewish associations, to whom he promised that the Jews of France would be protected. In November 2003, on French national TV France 2, he blasted Islamic preacher Tariq Ramadan, who had written an inflammatory article criticizing the continuous alignment of Jewish French intellectuals toward Israel in the Middle East conflict: "I did not like your article" Sarkozy launched firmly to Ramadan, "when one writes, one thinks with his head, not with his race" he continued. "Your article was not a mere mistake, it was a moral fault. Because when you write about Bernard-Henri Lévy or Andre Glucksmann, you deliberately characterize them as Jews, attacking them because of their religion not because of their ideas. We have seen the hatred against Jews and how it led to the deaths of millions of innocent men, women and children. I cannot tolerate it." "I have changed after visiting the memorial Yad Vashem during my trip to Jerusalem," he said. "I was so moved by the thousands of little lights and the continuous murmur of names of two-, four-, and five-year-olds killed by barbarians. It was the spirit of lost innocent souls. Anti-Semitism cannot be accepted because hatred of the Jews is unacceptable. Anti-Semitism is not the problem of the Jews. It is the problem of the French Republic and its institutions. Each time a Jew is insulted, it is spitting on the Républican values." 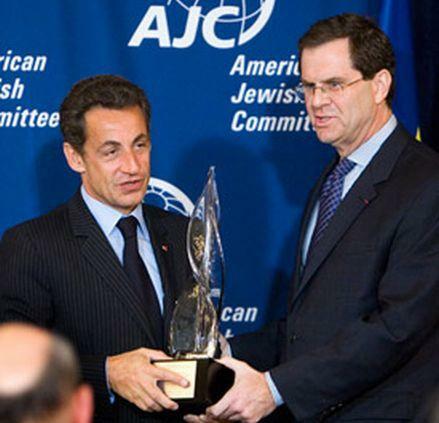 Sarkozy's efforts toward fighting anti-Semitism had been recognized by the American Jewish community: in 2003, the Simon Wiesenthal center gave him a prize to honor his courage. And in 2004, David Harris, Director of the American Jewish Committee, recognized Sarkozy as a man of charisma, vision, and dynamism. Back home in March 2006, as Minister of Interior, he was awarded the prize of Homme Politique de l'Année, Political Man of the Year, by the UPJF, Union of Jewish Professionals of France. Because Sarkozy showed certain continuity in his action and presented himself as a friend of Jews and of Israel, he became the natural candidate of Jewish voters. Jews felt relieved when he was elected as Segolene Royal's opponent, as Royal was perceived as too shallow and unprepared to lead as president. Her popularity among Muslim immigrants and the support she got from the pro-Palestinian extreme left groups turned many Jews away from her. Sarkozy’s France has the face of Emile Zola, the writer who signed "J'accuse" to defend Captain Dreyfus, unjustly condemned with treason. Sarkozy’s France has the face of French heroes and resistants like Guy Moquet, shot with his comrades by the Nazis at the age of 17. Sarkozy’s France has the face of Simone Veil, an Auschwitz survivor, one of the most respectable politicians in France. Nicolas Sarkozy entrusted a certain number of missions to young and brilliant attorney Arno Klarsfeld. Arno’s parents, the famous Serge and Beate Klarsfeld, had traveled the world to chase hidden Nazi criminals to bring them to Justice. The choice of Arno was not totally neutral. In 1998, defense lawyer for the plaintiff in the trial of Maurice Papon, a former civil servant responsible for the deportation of thousands of Jews from Bordeaux, Arno Klarsfeld represented l’Association des Filles et Fils de Deportés Juifs de France (Association of Daughters & Sons of French Jewish Deportees). In 2002, at the age of 37 years old, Arno took the Israeli nationality and engaged into the Magav, the frontier guards of Tsahal. In February 2005, Sarkozy asked Arno Klarsfeld again to undertake a "study on history and the duty of memory," in the context of the colonization which was dividing Historians. Later, Sarkozy again commissioned him to analyze the cause of minors' delinquency and then appointed him as a mediator of the government in the conflict opposing the state to irregular immigrants exposed to pending deportations. In May 2006, Sarkozy requested from the Minister of Justice to prohibit the Tribe KA, a mysterious Afro-racist and anti-Semite collective, directed by Kemi Seba, a violent Benin-born preacher of hate. The government dissolved the organization and its Internet website in July 2006. It was seen as continuity in Sarkozy’s approach. Unlike many of his predecessors, he was not only talking, he was also acting. If there is one leader who has rejoiced from the departure of Jacques Chirac as Head of State, it’s George Bush. Yes, Chirac had immediately visited NYC after the tragic 9/11 events, flying over the still smoking collapsed towers in a helicopter. But there was a palpable dislike between the two men. During his campaign, Sarkozy had promised closer cooperation with the United States. And French voters could not have missed Sarkozy's admiration for America or his American-style conservative policies. "Your detractors call you 'Sarko the American.' Why?" a CBS journalist asked him recently. "Because I love America. I want to be a friend of America," the newly elected President replied. "But the name?" she asked. "I am proud of this nickname." "What do you most want them to know about you?" the journalist continued. "I want the Americans to know that they can count on us," Sarkozy explained. "But, at the same time, we want to be free to disagree." "My devotion to our relationship with America is well known and has earned me substantial criticism in France," he said. "I'm not a coward. I'm proud of this friendship, and I proclaim it gladly." To underscore his message, Sarkozy went so far as to spend his first vacation as President of France on Lake Winnipesauke in New Hampshire with his family. He stayed in the 11-bathroom shorefront mansion of former Microsoft executive Michael Appe. The Bush family, nearby in their summer residence in Maine, invited him over for hot dogs, hamburgers, and a little Franco-American bonding. It is true that U.S.-French relations had been sour for years, but in 2003 disagreement over the war in Iraq plunged them to a new low when then-President Jacques Chirac openly opposed the Bush administration. In the U.S., all things French were denigrated by the most radical: French wine was boycotted and French fries renamed "Freedom Fries." "It became very heated and unpleasant at times," remembers Jean David Lévitte, France's former Ambassador to Washington. Now appointed as Sarkozy’s National Security Adviser, Jean David Lévitte told 60 Minutes improving U.S. relations was a top Sarkozy priority. When the new French president visited the White House this past October, the visit symbolized how much French-American relations had improved since the war in Iraq. During his address to the Congress, Sarkozy got a couple of standing ovations. By many aspects, Sarkozy supports the Bush administration. He also rejects the idea of premature withdrawal of troops from Iraq and Afghanistan: "At a time when Pakistan is unstable and vulnerable to terrorists, giving the signal of departure of our troops would be a mistake" he declared in a press conference at the Elysee palace. In 2005, he led efforts to strengthen France's laws against terrorism in response to the deadly July bombings in London. Sarkozy had said the top threat against France was coming from groups outside the country. He cited the Algerian Salafist Group for Call and Combat which had declared allegiance to Al-Qaeda. He presented a tough anti-terrorism bill to strengthen controls on movements of certain people. His bill also allowed extended investigative powers to anti-terror cells in order to track down terrorists and to listen to their telephone calls and electronic devices. He enabled police to monitor more closely citizens who travel to countries known to harbor terror training camps. Under his impulse, more than 19 radical Muslim preachers got expelled from France in 2005. In 2006, he visited the United States to commemorate the September 11 attacks and took the opportunity to meet with Kofi Annan, then United Nations Secretary. In France, his detractors suggested that the meeting was beyond the boundaries of his current portfolio, but he rejected that idea, and said that he spoke within his capacity as the Interior Minister, as the number two Minister of the French government and as France's top cop largely responsible for national security: "I have a responsibility to ensure the security of the French people" he explained. At Christmas time, he made a surprise visit to French troops posted in Afghanistan with his Minister of Defense. France has had stationed troops in Afghanistan since late 2001, when US-led forces drove the Taliban government out of power. "We cannot and will not lose war against terrorism, against fanatics," he said, and he promised to continue helping the Afghan army and government. Sarkozy is not a politician sheltered in ideologies or dogmas. On foreign policy, he is a blunt-speaking realist. Sarkozy was not free at all as Interior Minister in Chirac’s government. As I said earlier, he had opposite views on many major matters including on Foreign policy and relationship with the USA. In December 2004, then with no ministerial function, Nicolas Sarkozy visited Israel for 48 hours. He met with Ariel Sharon, Prime Minister at the time, who told him: "I hope you are aware that Israel considers you as a friend." He also met with Shimon Peres, which was then head of the Labor Party, Avoda. Contrary to the majority of the European political leaders, Nicolas Sarkozy did not visit the Palestinian territories. And that did not go unnoticed in the Arab world. To the French community in Tel Aviv, he insisted that Israel is a democracy — Friend of France. If there is no "Jewish vote," stricto sensu, in France, it is nonetheless remarkable that the vote expressed by the French community of Israel held the record percentage of votes in favor of Nicolas Sarkozy all over the world: 90%. Obviously French Jews in Israel had chosen someone who had the courage to call himself "friend of Israel" and who had the audacity to visit Israel at a time when its public image was at its worst in Europe. With the accession of Nicolas Sarkozy to power, Israeli leaders and the moderate fringe of leaders in the Middle East rejoiced that a new chapter of France’s relations with states in the region will open. The Israeli media had praised the Sarkozy victory saying that it was "the prelude to a new era relations with France", according to Yediot Aharonot. Maariv spoke of the "French revolution" as an open friend of Israel has entered the Elysee for the first time in the history of the Fifth Republic and described him as an "honest mediator." At the beginning of the second war with Lebanon, on French television, Nicolas Sarkozy clearly pointed to the Hezbollah as the aggressor after the kidnap of three Israeli soldiers, Ehud Goldwasser, Eyal Regev and Guilad Shalit (also a French citizen). He analyzed the situation as very concerning because it could escalate into a major confrontation throughout the Middle East. He hammered that Israel had the right to defend itself even if he was recommending that Israel’s response would be proportionate to the attack. He insisted that Lebanon had a right to independence and to the respect of its integrity and unity: "The irresponsible behavior of Hezbollah has led to the desegregation of Lebanon and it is necessary to clean up Lebanon from external influences" he concluded. During the campaign, in early December 2006, his opponent Segolene Royal, on a tour of the region stirred up controversy after meeting with Hezbollah politician Ali Ammar in Beirut. This incident would make her lose the support of French Jews, who disagreed strongly that a French presidential hopeful would meet with Hezbollah leaders as politicians, omitting their status of terrorists. Meanwhile, Sarkozy had worried Arab leaders by displaying open friendship with Israel and rejecting anti-Americanism. He stunned a group of Arab Ambassadors, telling them "his foreign policy priority as president would be to forge a closer relationship with Israel." "France has friends in the Arab world . . . and friends in Israel" he said. In October, Sarkozy hosted Prime Minister Ehoud Olmert at the Elysee. He expressed strong support for Israel, describing the establishment of the state as "a miracle" and "the most significant event of the 20th century." "They say that I support Israel because my grandfather was Jewish, but this isn't a personal matter," Israeli sources reported. "Israel introduces diversity and democracy to the Middle East. It's a miracle that after millions of Jews were murdered, such a state has been able to arise." Sarkozy also told Ehud Olmert that he thinks Palestinian refugees should be resettled in a Palestinian state, not in Israel. "Each side should have its own nation-state," he said, according to Israeli officials who were present at the two leaders' meeting. "It is not reasonable for the Palestinians to demand both an independent state and also the refugees' return to the State of Israel, which even today has a minority of 1 million Arabs." To the Palestinians, Sarkozy had repeated that the "existence and the security of the State of Israel are not negotiable and that nothing can justify violence." "We will never jeopardize Israel’s safety." Nicolas Sarkozy understands that the Israeli-Palestinian conflict divides the Middle-East in two camps: the moderate countries and the extremist countries. Last month, France hosted in Paris the International conference of Donors for the Palestinian State. The conference raised more than seven billion dollars to help Palestinian economy. Arab countries were satisfied with the outcome and the goodwill showed by Sarkozy as host of the conference. However, Hamas slammed it, calling it a "dangerous conspiracy" to divide Palestinians and destroy the Islamist movement. Hamas spokesman Farwhad Barhum charged that the real purpose of the meeting was to further divide Palestinians by rearming President Mahmoud Abbas. Sarkozy had called at the start of the conference for a new international force to beef up the Palestinian security services "when the time comes and when the conditions are right." But Hamas said the move was purely intended to help Israel in its "declared war" against the movement. Last week, while taking a tough stance with Syria announcing no more contacts between the two countries until Lebanon chooses its new president free of Syrian pressures, he sought to reassure Arab states concerned about his strong ties with Israel by asking Israel to make peace gestures: "It's time for Syria to prove with facts what it has not stopped saying in speeches. And Israel has to make gestures which would show that peace is possible, including ending settlements in the occupied West Bank" Sarkozy said. Obviously decades of prejudice and demands on Israel could not disappear in a few months. So can Nicolas Sarkozy do something for the advancement and eventually resolution of the peace process between Israel and the Palestinians? Sarkozy himself wants France to play a "facilitator" role in the Middle East. He wants to mark History. He will be leading a pragmatic and open minded policy with all his international partners. He believes that being friends with everyone in the region can give him a respected standing as a fair and balanced negotiator. He belongs to this rare breed of politicians who does not see the Middle East conflict exclusively as the result of territorial disputes. He is expected to make a state visit to Israel this coming spring.